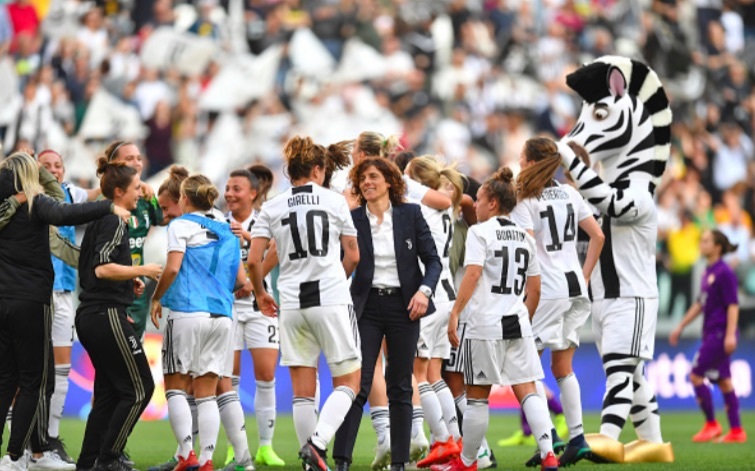 Juventus’ Allianz Stadium opened its doors to the club’s women’s team on Sunday afternoon and an incredible 39,000 spectators watched on as the Bianconere beat Fiorentina 1-0. Just last week, LaLiga Iberdrola saw a record-breaking 60,739 people watch on as the title race came alive with Barcelona grabbing a 2-0 win away to Atletico Madrid and it appears as though their Italian counterparts have taken inspiration from the idea. The previous Italian record was – what is itself an impressive – 14,000. Tickets were free, and the last up for grabs went up at lunchtime on Saturday when the game was declared a sell-out, with 129 away fans making the trip to Turin from Florence. On-field matters were important, too. The pair came into the game separated by just a point and occupying first and second place. Sofie Junge Pedersen got the game’s only goal in the 84th minute though as La Vecchia Signora extended their lead at the summit to four points. The Bianconere were only founded in July 2017 and won Serie A in their first season. Their dominance over Italian football looks set to be shared across both their men’s and women’s sides now as they are well-placed to make it two wins from two seasons in existence.